bhrAjata iti tacchIlo bhrAjishNuh - One who has the habit of being effulgent. The name is derived from the root bhrAjR and the pANini sutra 3.2.138 - bhuvasca - which states that the afix ishNuc in the sense of "the agent having such a a habit etc." comes after the verbs such as bhU, bhrAjR etc. SrI Bhattar points out that it is the nature of bhagavAn to show Himself to His worshippers. An author by name satyadevo vAsishTha, who has written a detailed vyAkhyAna for Sri vishNu shasranAma in samskRt in this century, points out that the radiance in the sun, the moon, etc. arise only because they derive it from the effulgence of vishNu. Sri rAdhAkRshNa Sastri points out that we see objects because of the light that makes them visible, and we see the light only because it gets scattered by the objects. But bhagavAn is Pure Effulgence without any association with any object, and this is why the non-devotees don't see Him, though He makes Himself visible to His devotees. "brahma surya samam jyotih"; "suryo jyotir-jyotih surya" etc. One who is the object of enjoyment. 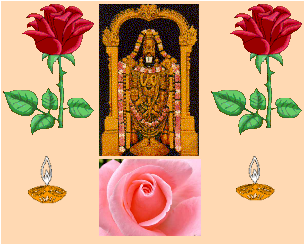 bhagavAn is bhojanam because He is enjoyed with pleasure by His worshippers. bhojanam also means literally food or the means of sustenance. Even though in nature one object becomes the means of sustenance of another object, He is the one who maintains this balance and sustains everything. The vedAntic interpretation for bhojanam is the collection of all objects of enjoyment by the sense-organs. He makes the objects of this world fit for enjoyment, and He also becomes the object of enjoyment Himself when His devotee overcomes the desire for the material objects of enjoyment and longs for Him. "If a devotee offers to me a mere leaf, flower, fruit, or water with sincere devotion and love, I accept it as invaluable treasure." aham hi sarva ya~jnAnAm bhokta - gItA 9.14. The word is derived from sah - to put up with, forgive. Note the grammatical rule quoted for bhrAjishNu earlier - the affix ishNuc is added to indicate one having a habit etc. Thus it is His Nature to forgive. We have the yajurvedic mantra "saho'si saho mayi dhehi". sah also means to suffer patiently. He is sahishNu because He suffers patiently, in His perfect detachment, all that is happening around. He is just a mere witness. He continues to support this world without ever getting impatient - nAkshastapyate bhUribhArah - Rgvedic manta. sahate also means conquers, and Sri Sankara uses this meaning and interprets this nAma as meaning that bhagavAn is sahishNu because He conquers daitya-s such as hiraNyAksha. In SrI Bhattar's vyAkhyAna, the vyuha forms are covered up to the above nAma. .Starting with the next nAma, he interprets the guNa-s as reflecting those of the vibhava form of vishNu, the second of the trinities. He who was born at the beginning of the Universe. jagat + Adi + jAtah = jagadAdijah. Before the world got created, one who had the ability to create the world had to exist. Thus bhagavAn existed before the world was created. SrI chinmayAnanda points out that this is the manifestation of bhagavAn as HiraNyagarbha, the form where the world of all objects is submerged after pralaya and before the manifestation of the gross world emerges out. This is the manifestation of bhagavAn as the virAt Atma. "Thou art our refuge; Thou art the first-born amongst the gods. Thou art the Lord of the Universe. Thou didst assume the role of vishNu for the protection of all the worlds." One who is Sinless, Un-contaminated. aghah pApam na vidyate asmin iti anaghah. Though He resides in the midst of the samsAra in His incarnations, He is untainted by sins. Because He is unattached, He is not contaminated by the effects of any actions. Several passages in the sruti-s refer to this attribute - suddham apApaviddham - yajur 40.8, na puNya pApe mama (kaivalya 22), etc. vividham viSesheNa vA jayati iti vijayah - One who wins over everything in different and special ways. He is sat, cit, and Ananda rupa, and thus controls everything including the prakRti and jiva-s. Or He excels in everything - ~jnAna, vairAgya, aisvarya, etc. SrI Bhattar points out that He is vijaya because He controls everything that happens in this world, including the creation and destruction, which are performed by Brahma and Rudra with His help and guidance - "tad_AdarSita panthAnau sRshti samhAra kArakau - Guided by Him in the right way, Brahma and Rudra carry out the task of creation and destruction (MB moksha 169.19). sarvam jagat sa jayati iti jetA. He is jetA because nothing ever can happen that is not His will. All the other gods act His will. One who has satyam as His sthira guNa never has any failure or defeat. He is satya kAma, satya samkalpa, etc. The Cause of the Universe. viSvasya - sakalasya yonih - kAraNam viSva-yonih. Another interpretation is that He is viSva-yonih because He has the world as His Cause, i.e., He manifests Himself in various incarnations because of the condition of this world. One who lives again and again as the antarAtmA of all His creations. He is the Inner Soul of yourself and myself as well as those who are called the Released Souls" - MB moksha 179.4.